I’ve lived in my house for just over two years now, but in a way it just became mine. You see, my roommate moved out a couple of weeks ago. So, now, only my stuff is in the house. It’s not that I had anything against her stuff, but it is awfully nice to have my house all to myself. And I’ll just keep ignoring the very large, empty spots in certain rooms. 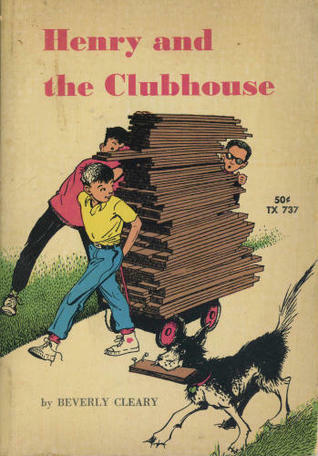 Right after she moved out, I happened to pick up Henry and the Clubhouse by Beverly Cleary. It seems like Ramona gets all the love, but I really adore Henry. He tries so hard and sometimes things (or Ramona!) just get in his way. In this book, he decides to build a doghouse. But when a neighbor tears down a garage, Henry realizes there’s enough wood to make a fine clubhouse (Recycle and reuse!!). His friends Robert and Murph help with hauling wood–and Murph even insists on drawing up a plan. It turns into a most impressive clubhouse, with a sign that says “No Girls Allowed” and a large taxidermy owl. Beezus tries to help–offering to make curtains or find a door mat. But the boys insist that such niceties aren’t needed. They even come up with a “secret” password for the boys. At last the clubhouse was finished. The siding was snug and tight. The hinges worked perfectly, the asphalt shingles were nailed down so securetly the roof could not possibly leak. Yes, the boys agreed, it was a good solid house. It was just about as solid as a real house. They thumped the walls appreciatively and stamped their feet on the floor. And the best part of it was, it was big enough for three boys to sleep in if they didn’t move around much, and who could move around in a sleeping bag? I may be a grown-up, with a prefectly fine “real house” of my own, but part of me still wants a little club house like that. What is about club houses? Is it just the charm of a tiny space? We have a playhouse at the museum, and our curator has often said it’s her favorite building. And of course, the kids all love it–something just for them–but why are we adults still in love with the idea of a play house? Two of my favorite books from chidhood also feature clubhouses or playhouses or whatever you want to call them. Andrew Henry’s Meadow by Doris Burn is about a boy who’s family doesn’t like his tendency to build things. So he heads out to a meadow and builds his own tiny house. Soon enough, other kids who have hobbies that don’t have full parental approval also head out to the meadow–and Andrew Henry builds houses for them too. Each is different–and each house is absolutely charming. One girl gets a house that looks like a castle: “Jane had her dress-up clotes with her. She hoped her mother wouldn’t miss them too much. She explained that they made her feel like Lady Jane instead of just plain Jane.” Of course, eventually, the families miss the kids and the kids head back home. The marvelous houses aren’t mentioned again (Andrew Henry is given a spot in the basement to build), but I like to think the kids kept escaping to their little kid colony to be themselves. All of the kids in these stories had plenty of unstructured time to build a house (or follow around a handy-man!) and just play. I never want to be one of those people that bemoans what kids today are missing, but I do wonder how many kids today have that intense desire to have a tiny little space all their own. A space for them to let their imagination run wild. Or as Jane put it, a place where she “feels like Lady Jane instead of plain Jane.” Are little houses like these now a part of history? Somehow, the playground sets that feature little houses on stilts just aren’t the same. It’s probably more than a coincidence that I’m revisiting Klickitat Street just before the latest movie version of Ramona comes out. Back in the day, I really liked the tv version with Sarah Polley (also know for being in Avonlea, who’s source material is another favorite author). And the previews for the movie look pretty decent. But I know there are people that are _seriously_ upset whenever a movie messes with a beloved classic. Another friend shared this review from Horn Book which makes me fairly optimistic. So my question for you: are you going to see it? Are you going to wait until its on DVD so you can drink heavily and/or curse loudly while watching it? Or are you going to avoid like its the Worst Thing That Ever Happened in Hollywood? Do you have favorite movie versions of books? Most horrifying? Last week, I decided to revisit Klickitat Street for the first time in years. Quite early in Henry and Ribsy’s adventures, I ran across this passage in which Henry calls his mom to ask if he can bring home a dog. Now, I’ve used a pay phone before, but in this age of cell phones, how many kids are familiar with phone booths? Or have ever heard of talking to an operator? Or a phone book rather than google? Later, there’s a scene where Henry attempts to use a typewriter to fake a note from his mom to his teacher–all to get him out of the school play. Now, kids are certainly familiar with typing, but are they going to understand the difficulties Henry had in typing a short note? 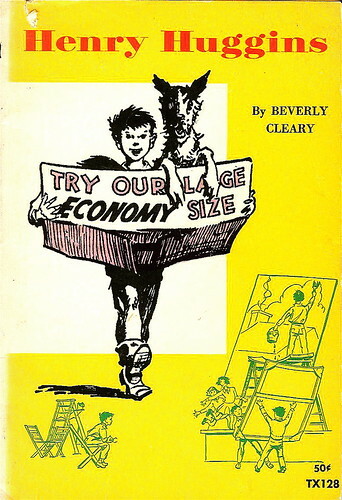 Henry Huggins was Beverly Cleary’s first book, published in 1950. She wrote it for the little boys in the library that wanted a book featuring “a boy like me.” Sixty years later, Henry is still in print and still much loved. Unlike most of the authors I talk about here, Beverly Cleary is still going strong (well, as strong as anyone can be at 94!). I just love her author’s website, which includes an interactive map of Klickitat Street. Henry was a contemporary novel back in 1950–none of the technology or little details of daily life were unusual to the first readers. But now? Has it become historical? In my mind, there are two types of kidlit history–those books that are based on the author’s past and those books that have become historical by surviving. What really separates the two is that the writer looking back has a general idea about things that might confuse their readers. 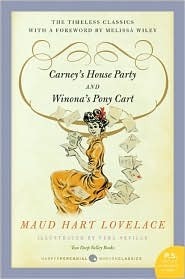 Hence, the wealth of details and explanations in the Little House books or even Betsy-Tacy. But Cleary is assuming that her readers know all about typewriters–they know that correcting mistakes was virtually impossible. They had a really good idea why Henry struggled so with that note–while kids today, so comfortable with the ease of computer editing, won’t. All the bits of technology aside, I fell in love with Henry all over again on this reread. It has been a very, very long time since I’ve read any Cleary. The last thing by her that I’ve read was her two memoirs, A Girl From Yamhill and My Own Two Feet, and that was more than a few years ago. But on my midwestern road trip, I kept running into Cleary books for next to nothing–it was like the universe was telling me that it was time for me to revisit Klickitat Street. So I see lots of Cleary in my immediate future.